Easywalker are a brand that I highly recommend. I have tried out a number of their products over the last year and really loved the service that I have received and of course the product its self. 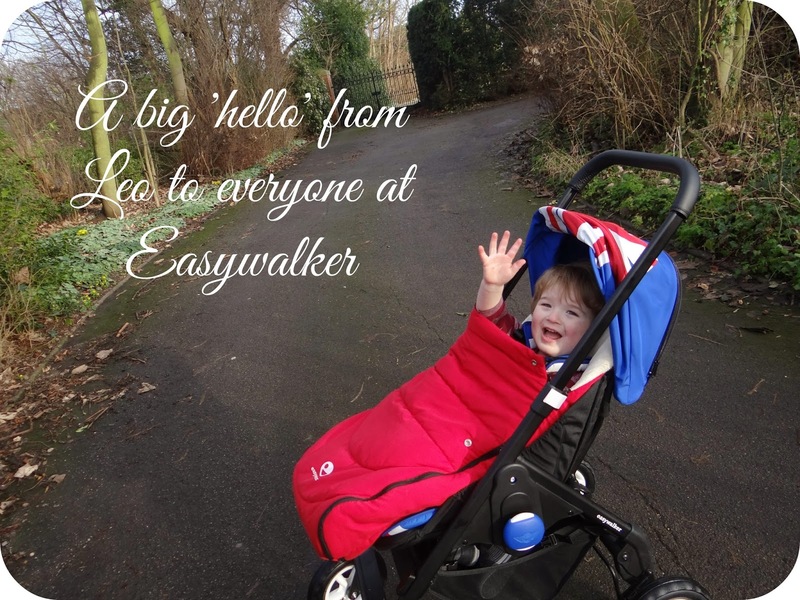 You may have already seen my thoughts on the Easywalker June and the Easywalker Duo? Over recent months I have been trying out the new Mini stroller. 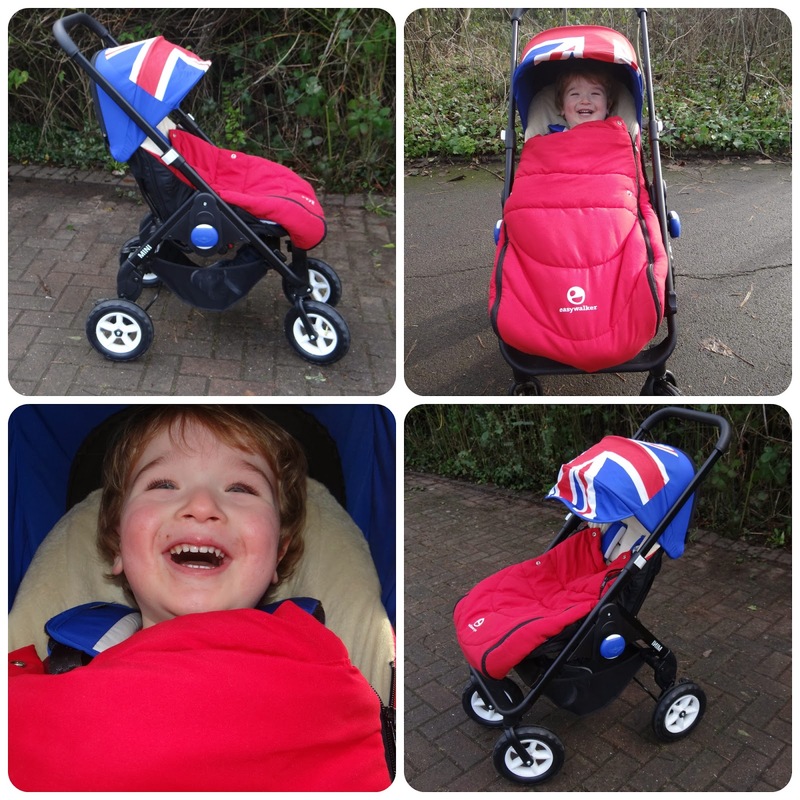 The Mini stroller was born when Easywalker teamed up with Mini and produced this one of a kind pushchair. In true Mini style Easywalker have provided us with a number of different colour ways to reflect the vibrance of the Mini, and it is suffice to say that they are sure to turn the heads of passers by. The Easywalker Mini as a stroller is suitable for babies from the age of 6 months, but you can also purchase a pram cot separately which opens up the Mini to newborn babies. 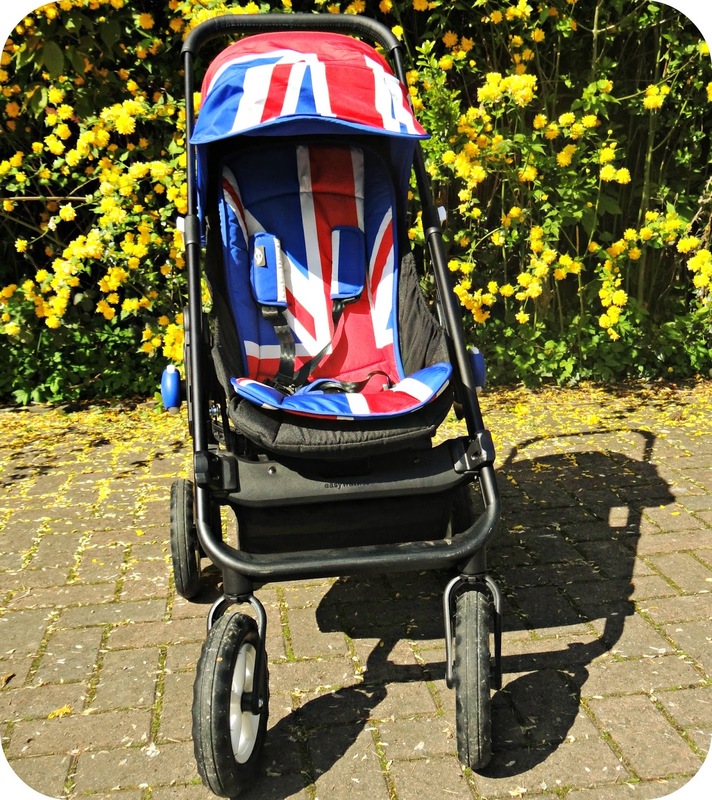 If I do go on to have anymore children, I will definitely be investing in the pram cot to go with my Mini. The Mini stroller will see your little one through until the buggy days are far behind you, the weight it can hold is up to 30kg which is around the ages of 7-9 years old! Not that you should probably need it into those ages, but if your child is a bit bigger then it is great to know that they won't be outgrowing it in the near future. I have been road testing the Mini in the Union Jack colour way, it is bright and really fun to look at. I first saw it at the Baby Show back in May and instantly fell in love with it. Of course as soon as it arrived I had to get it all set up and take it out instantly for a joy ride. You will have a separate box with your colour pack inside. The Mini is relatively easy to get up and running, and is very similar to the assembly of the June. 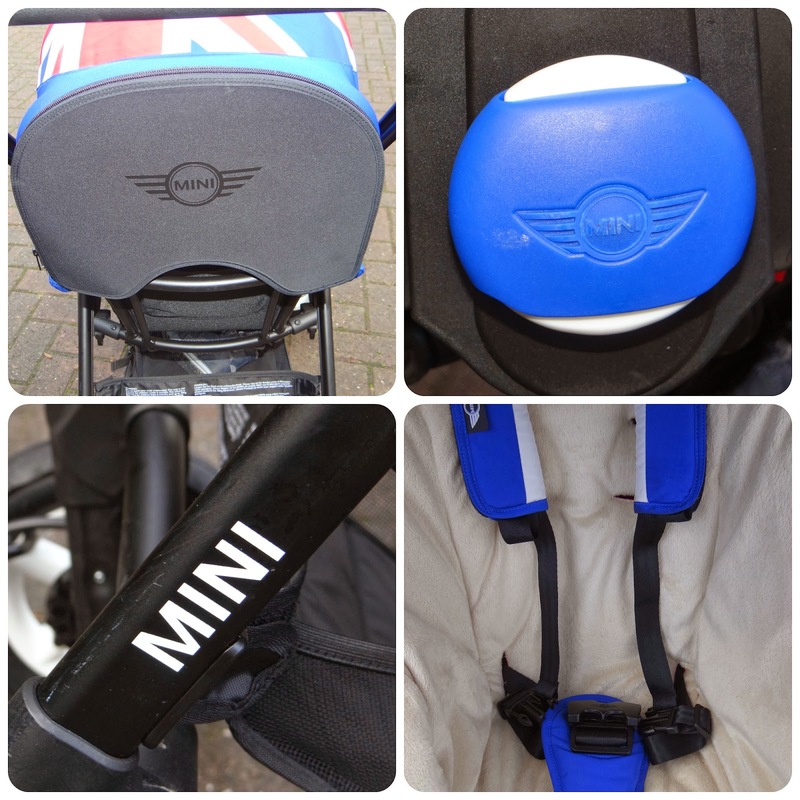 The seat unit comes attached to the chassis as standard, so all you need to do is un-clip the travel lock on the side in order to open out the pushchair. Extend the handle out and put it on its side so that you can attach the wheels, the wheels simply click into place. The most work for the set-up of the Mini is actually located on the seat unit its self. You need to insert your chosen colour pack seat padding. Thread the 5 point harness and thread the hood onto the zip while getting the hinges to click into place. It was the hood that actually slowed my progress down, but I managed to get the Mini up and running pretty quickly and was ready to get it out on the open road. I had incredibly high expectations for the Mini, partly because I have loved using the June so much and I knew that this new model had a few more luxuries included. So what did I think now I had the Mini stood right in front of me? I was really impressed. I loved how it looked, and I was really pleased with the leather handlebar with the Mini logo pride of place in the centre. The Union Jack colour pack for me was the ultimate colour way, and it certainly looked the part against the black frame and white wheel rims. There are many similarities between the June and the new Mini, and Easywalker seem to have kept everything that I loved about the June and just made it even better. The Easywalker Mini has all the aspects that I love on a off roading pushchair and the size and ease of an urban pushchair. For me it is the whole package. It gives me the freedom to leave the pavements behind and take a short cut across the field without any issues of the wheels getting stuck, and it also lets me nip off around the shopping centre. The size is one of the aspects that really amazes me about this pushchair, it does everything that a full size pushchair should, but is nowhere near as big as other models I have used over the years. I can fit the Mini down the centre of a train which is a real bonus, if I am heading off anywhere and want to change carriages without actually getting off the train. If I need to collapse the Mini I can do so easily and store it away at the back of the train or with all of the luggage. 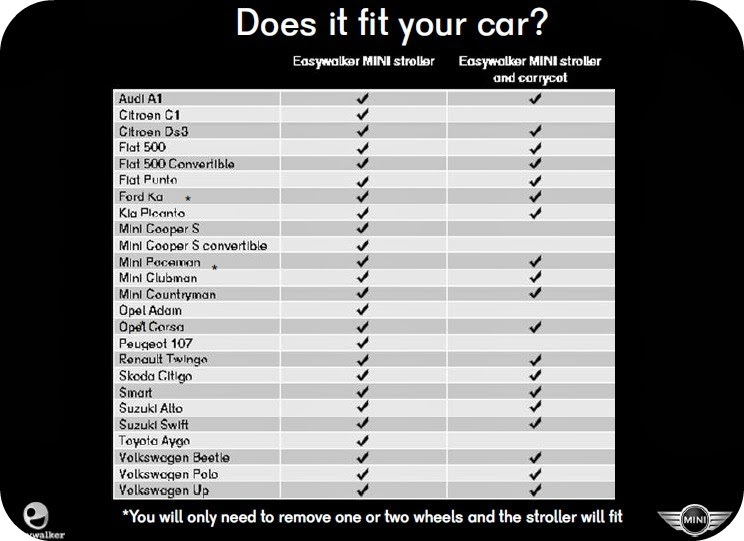 The size of the Mini means that it fits in the boot space of many smaller cars including my Peugeot 206 (and of course the boot of the Mini). 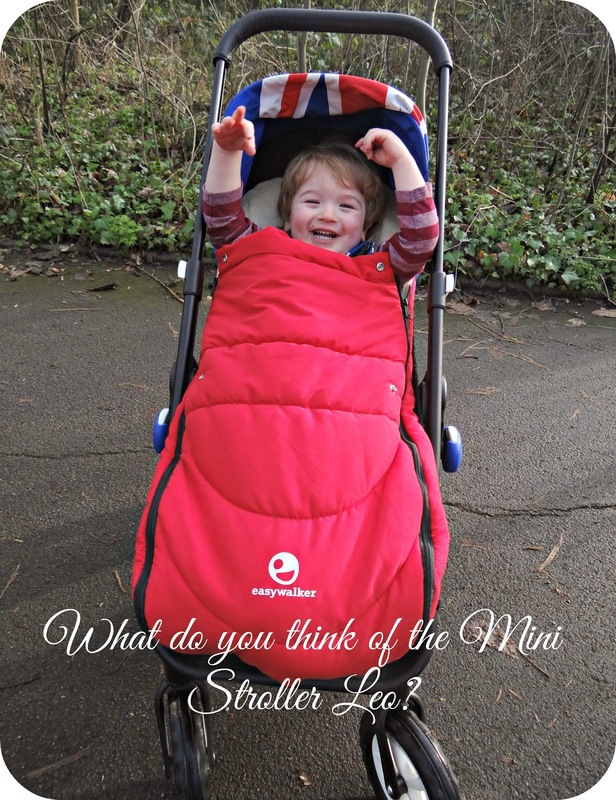 The Mini is a very sturdy pushchair and when in use I have never felt that it didn't stand up to expectations, the frame is well constructed and you can really feel this in it's everyday use. The suspension is fantastic, just ask Leo as he doesn't seem to realise just how shocking my pram driving still is even 2 years later... And that is down to the Mini. The Mini is equipped with four suspension and shock absorbing, all terrain wheels. This is why the ride is such a smooth one despite the terrain you are traveling along. These wheels are firm favorites with me as it just means that the Mini takes everything in it's stride. The leather handle bar is a feature that I really like on the Mini, it makes pushing this pushchair even more like driving a Mini car. The handlebar can be extended or lowered using the clips on either side of the Mini stroller, it caters for both Luke and myself and he likes that he can get the height that he needs out of the Mini. The comfort hasn't just been thought out for the parents however, the seat unit sits Leo comfortably with the option of having him reclined if he does fall asleep while we are out and about. The lever for the recline is actually situated under the front of the seat unit, it simply requires you to squeeze it and push backwards and it will slide into position. 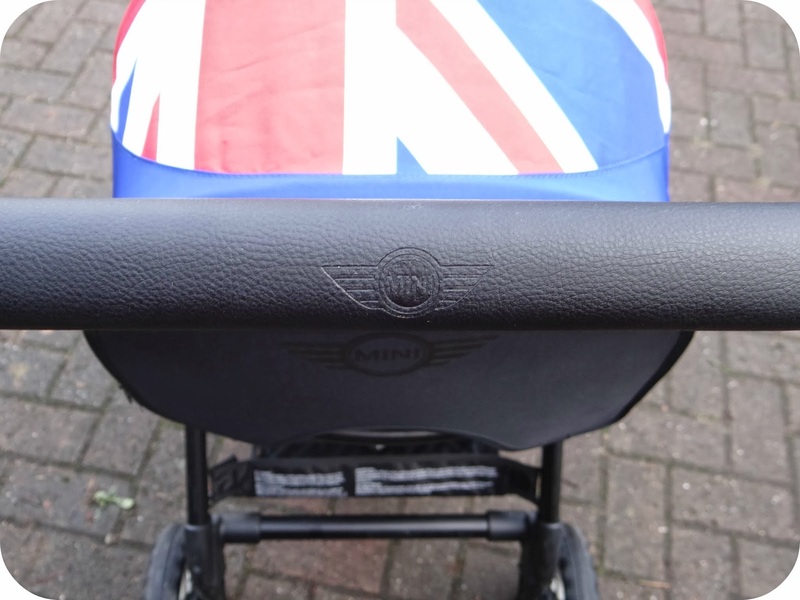 The Mini logo is embossed on the leather handlebar and has been included in the branding process, if you are looking into this pushchair because of the Mini connection then you really won't be disappointed. 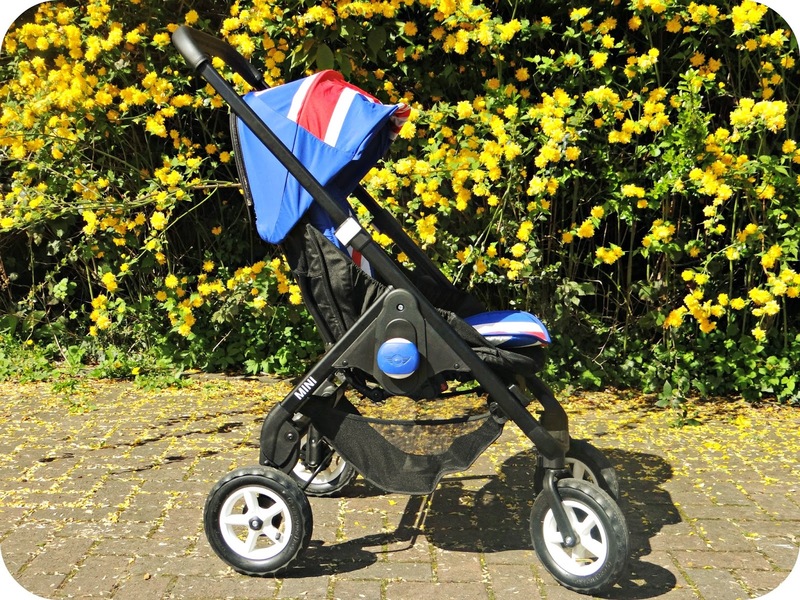 While I have been out and about with this stroller it really has turned heads with it's vibrant colours and jet black frame, and people have definitely recognised the Mini connection. While I was travelling on a train with Leo in the Mini, a young couple who had no children were admiring it. It started off as the young lady spotting it and pointing it out to her partner, I heard them talking about how nice it was... and then I heard the man tell his partner that there was no way they were having a baby! 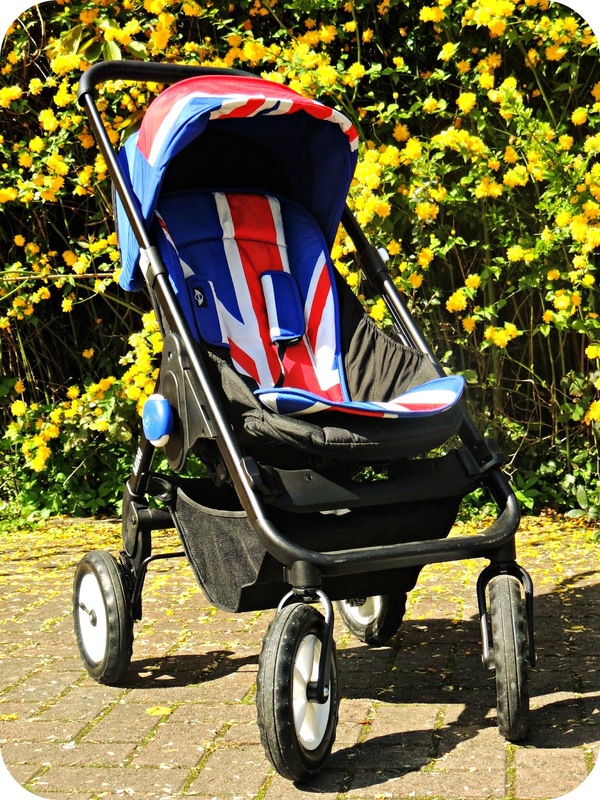 The hood is another great feature on this stroller, you can heighten or lower the hood depending on the babies height or where the sun is currently positioned in the sky. I like to have this flexibility to be able to solve Leo's discomfort if the sun is glaring in his eyes, it is simply a case of lowering the hood and popping out the sun visor. The brakes on the Mini are so simple to use, it is a kick on kick off brake that you can use with ease. This means even if you are wearing your flip flops in the height of the summer, you will be able to use this brake with no problem at all. Heck I could even do this in heels if I was brave enough! The shopping basket is a reasonable size, it's not the biggest but I have always managed to get everything that I need inside. The changing bag sits comfortably on the handle of the stroller so I don't need to worry about storing that in the basket anyway. It is big enough to fit a few bags of shopping in the bottom (of course depending on what you buy). Now opening the Mini up is a really simple task, and only requires you to un-lock the transport lock and pull up the handle so that you can lock it into the open position. Closing the Mini is something that I sometimes find a really simple task, and others I just can’t get it to co-operate with me. Firstly you need to recline the seat unit, then you need to squeeze the buttons on either side of the frame. Wait until you hear a ‘click’ and then you can collapse the pushchair down. Once the pushchair is collapsed you just need to do up the travel lock. Over all I really love the Easywalker Mini, it is everything that I need in a stroller. From a practical point of view it's the actual size and weight of the Mini (even with my 2 year old in it) to being able to fit it in my car that score the Mini big brownie points. From a materialistic point of view I love just how it looks, there are so many different ways you can have your Mini looking as you can invest in different colour packs as you go on. The Easywalker Mini retails at £609.99 and is at the higher spectrum of the stroller market, but I can quite honestly say that the product you receive for your money is fantastic. 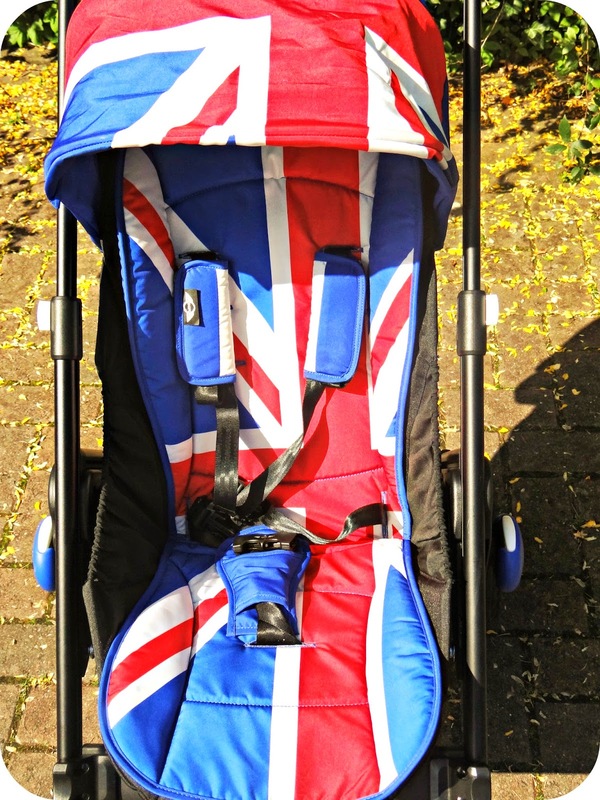 The quality and materials used to complete the Mini are second to none, I personally love this stroller and it really is my pushchair of choice. Disclaimer: I was sent the Easywalker Mini for the purpose of this review. All views and opinions expressed are completely honest and my own.